For this month’s Leftovers Club, I was paired with Lauren from Healthy Delicious. Last time we were paired together I decided it’d be fun to send her these Pancakes and Bacon Cookies, clearly not remembering that her site literally has the word “healthy” in the title. Oops. This time I calmed it down and threw some healthy protein-packed slivered almonds into biscotti and shipped them off. Not the healthiest thing ever, but clearly better than cookies chock full of maple syrup. 2. Combine flour, baking powder, cinnamon, nutmeg, and sugar in a large bowl. 3. Add the eggs and almond extract until well combined. 4. Fold in the slivered almonds. 5. Pour dough onto a baking sheet lined with aluminum foil. Shape so it is in a long brick. Bake for 25 minutes. 7. Adjust the heat of the oven to 325 F and return the biscotti to the oven for an additional 20 minutes. Interested to see what all my friends made this month? Here’s links to all of their great recipes! Cat’s Tongue Cookies – The Urban Mrs. 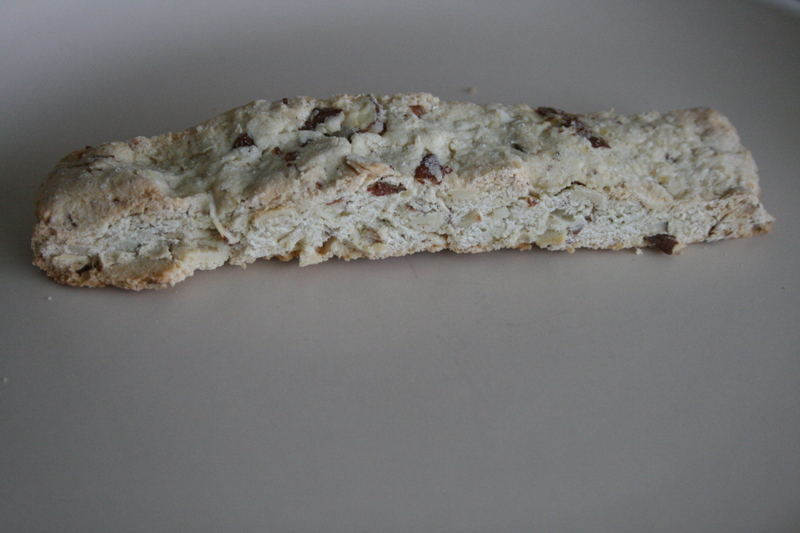 This entry was posted in Desserts and tagged almond, biscotti, snack. Bookmark the permalink. I would love the bacon and pancake cookies– but these look delish too! Why is this like the easiest recipe ever?! Who knew? I love it!!! I haven’t made biscotti in forever and it is time!!! Love that you “calmed down”. Haha. I’m sure she loved the pancake and bacon cookies just as much!! Biscotti are the perfect dippers! Love the almond flavor – simple and classic! Ha I don’t think I sent Lauren anything particularly healthy either lol. These look fantastic!